The Obama administration misled journalists and lawmakers for more than nine months about a secret agreement to lift international sanctions on a critical funding node of Iran’s ballistic missile program, as part of a broader "ransom" package earlier this year that involved Iran freeing several U.S. hostages, according to U.S. officials and congressional sources apprised of the situation. The administration agreed to immediately lift global restrictions on Iran’s Bank Sepah—a bank the Treasury Department described in 2007 as the "linchpin of Iran’s missile procurement"–eight years before they were to be lifted under last summer’s comprehensive nuclear agreement. 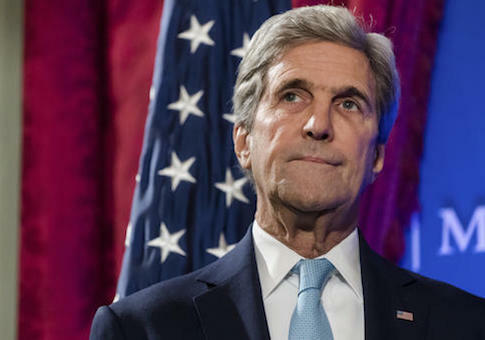 U.S. officials initially described the move as a "goodwill gesture" to Iran. State Department officials who spoke to the Free Beacon now say the United States "already made" the decision to drop U.S. sanctions, but declined to address multiple questions aimed at clarifying the discrepancy between past and current explanations for dropping international sanctions. State Department officials told the Free Beacon at the time that the settlement with Iran, including the $1.7 billion cash award, was "not related" to "the release of the U.S. citizens from Iran." U.S. officials last week confirmed to the Wall Street Journal that in fact the dropping of sanctions on Bank Sepah "was part of a package of tightly scripted agreements" surrounding the release of the U.S. citizens from Iran. When asked about the discrepancies between these statements, a State Department official would not elaborate, instead telling the Free Beacon, "The U.S. government had already made the determination that it would remove Bank Sepah from our domestic Specially Designated Nationals and Blocked Persons List on Implementation Day, which was outlined clearly in the JCPOA [nuclear deal] itself in July 2015." "We made this determination after a careful review of the activity of all individuals and entities—including Bank Sepah—that would be removed from the SDN list," the official explained. "Although we removed Bank Sepah from the U.S. SDN list, Bank Sepah will continue to be cut off from the U.S. financial system and its funds under U.S. jurisdiction will remain blocked. Furthermore, we have the ability to quickly reimpose additional U.S. sanctions if Bank Sepah or any other entity engages in activities that remain sanctionable." The Free Beacon was not the only publication that was provided with misleading information by the Obama administration. U.S. officials told Al Monitor in late January that the move to cancel international sanctions on Bank Sepah at the United Nations was undertaken by Venezuela without U.S. action. "We already made the decision to delist this bank as part of U.S. secondary sanctions as part of the nuclear deal," the official added, claiming the United States only agreed "not to oppose the delisting at the U.N., which Iran very much wanted." Senior Iranian officials said in January that the $1.7 billion payment and delisting of Bank Sepah were part of the agreement to free U.S. hostages, a charge the Obama administration denied at the time. "The annulment of sanctions against Iran’s Bank Sepah and reclaiming of $1.7mln of Iran’s frozen assets after 36 years showed that the U.S. doesn’t understand anything but the language of force," Mohammad Reza Naqdi, commander of Iran’s Basij Volunteer Force, told Iran’s state-controlled press in early February. "Facts are facts, no matter how much the administration tries to hide them," said one senior congressional aide involved in investigating the matter. "Journalists and Members of Congress are on the trail and have already uncovered so much, including the cash payment of almost $2 billion to the world’s largest state sponsor of terrorism as a ransom for four American hostages. The truth, no matter how disturbing it is, will continue to come out." "This should eliminate any remaining doubt that the administration paid a ransom to Iran," said another source familiar with the issue. "Why else would they keep Congress and the American people in the dark about this unprecedented concession? President Obama’s continued capitulation to the Iranian regime is a hazard to our national security." Another source who serves as a senior adviser to Congress and is familiar with the administration’s thinking told the Free Beacon that the Obama administration misled the public to avoid sparking outrage over its decision to drop sanctions on the top funder of Iran’s ballistic missile program. "The Obama administration couldn’t tell the American public that it had just unleashed Iran’s ballistic missile program as one part of an enormous ransom extracted by Iran," the source said. "So instead they ran to friendly reporters to misleadingly boast about how successful their diplomacy was, while they were bribing Iran with billions of dollars and military concessions to stay at the table." The Foundation for Defense of Democracies, a Washington, D.C.-based think tank, described the administration’s move as putting Iran’s ballistic missile program "back in business." "It represents a unilateral dismantling of the international ballistic missile embargo against the Islamic Republic," FDD wrote in a recent policy analysis. "Iran’s preferred missile-financing bank is back in business." Iran has test fired multiple ballistic missiles since the nuclear deal was implemented, despite international restrictions on this type of activity.